Neck: notice to two new red Babesia dots but there are many others barely visible to the eye and not noticeable in this picture. Juts yesterday I noticed the small, blood red, pin-prick sized Babesia marks are starting to break out again. I had these same tiny marks start to break out last year (or the year before) while on a combo of Mepron, Zithromax and Artemisinin. 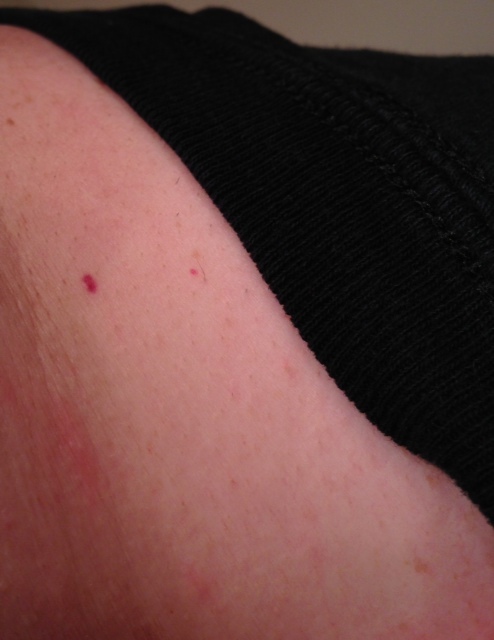 Yes these red marks are common and many people get them and a PCP, Rheum or dermatologist will tell you they are not Babesia but these marks are tinier than the common ones. A common red mark is misshaped or pretty visible to the eye whereas the Babesia marks are usual round, barely visible and very bright, blood-red. Plus with the common ones they start to pop up infrequently and over time as you age where the Babesia marks seem to show up in clusters after taking meds. I am told tis is because the bugs are trying to reach the skin for oxygen (this could be wrong). Last time I broke out I knew I had never seen such a red mark on me before. Then about 2 weeks into Mepron use I could feel the bugs dying off and the tiny red dots started breaking out from my shoulders all the way to my forearms and some on my body. The new ones are breaking out from my neck down. There is one on my neck that is a lot larger than usual and that is how I noticed the break out. I then looked in the mirror and barely could make out many new ones running down my neck to my check and shoulders. I have 20/18 (don’t ask me how my eyes are always dry from lyme and I’m lucky I still have good vision) so it is easier for me to see them. If you have poor vision you probably wont notice them. I had my phone appointment today with my LLMD and I received my blood test results finally. First we went over that my Babesia is far from dying off and it’s really angry and my Bartonella is causing havoc again. I will continue treatment for Bab and Bart and add in a new RX which I will list below. I am having the usual low oxygen/air-hunger, soaking night sweats, and my ankle pain is back along with the hundreds of other symptoms. 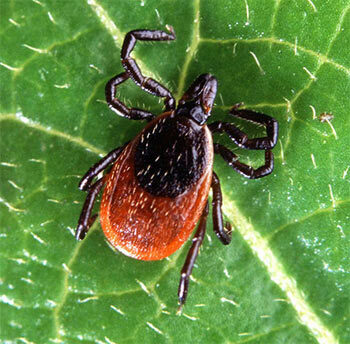 So for now my main focus is killing off (if that is possible) my Babesia and Bartonella along with other bugs while still treating the Lyme disease. As I have mentioned before and the name still slips my mind but I have the strain of Babesia which is harder to kill than the other species. After two years of antibiotics and no progress for Lyme, Bab or Bart you start to wonder if they will ever go away. I took notes while on the phone but my fatigue was so bad so I hope I can read my notes. I am stopping Suprax, continue Clindamycin, adding this and pulsing that which I will try to mention below. Although I have all of this I still enjoy the beauty of life and what I have. It is truly the little things that mean so much to me. Fall, football and the holidays are here so I am happy. Now if I can only find a girlfriend to keep me warm during these cold months I will be all set. I tested recently for my routine CBC but I also tested for Mycoplasma pneumoniae and Chlamydophila pneumoniae which I have always assumed I have had for 30 years and I finally have Medicare so I could afford to test for it. The CBC and routine blood work are to check my enzymes and organs and see how they are holding up while on antibiotics which everyone should do monthly or bi-monthly. 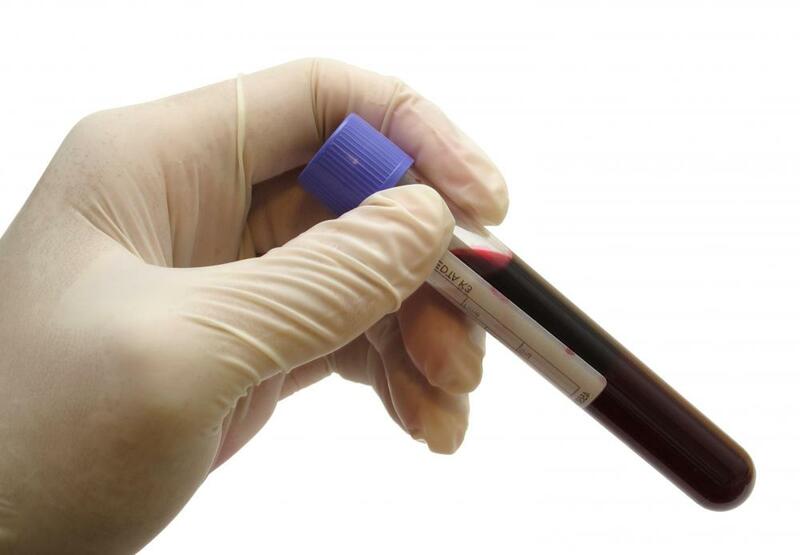 We also tested my blood for my thyroid such as T3 and for my Anti-nuclear antibody (ANA) count. So like always I received all bad news on the results. I have Hypothyroidism so my thyroid is slow and counts are usually low so having a high T3 sounds like my thyroid is out of whack. This is nothing that worries me but my T3 has never been high and my LLMD said a new study says having a high T3 (while so sick) is good so we will let it remain high. My ANA count being high can mean a lot of different things. My primary doctors have always suspected I have Lupus since it runs in the family so it could be Lupus. It could also mean Rheumatoid Arthritis (RA) which is what my pediatrician told my mom I would have when I got older when I was a child. I had Osteomyelitis when I was a baby and I lived in the hospital with an IV in my ankle bone marrow for a few months. The high ANA count could also be from fighting an infection which I am so it may be nothing but just joint pain. We are not really sure what to make of it. Mycoplasma pneumoniae and Chlamydophila pneumoniae both can cause pneumonia, lung issues and possible lung cancer. In 1999 I literally nearly died from elderly pneumonia. I had only 10% of one lung left to breath with. At that time the doctors all said “how the heck did you get elderly pneumonia at your age of 24 years old?”. Now I know why since I have been living with both of these pneumonia causing bugs in me for years. My primary doctors have never tested me for either pneumoniae and never followed up after I had pneumonia. So today wasn’t really unexpected news since I knew all along I have way more than I have tested for so far. I feel as if I am a walking petri dish so I figure there are more bugs I haven’t tested for yet. It just feels like getting kicked when you are already down when every time you have a test they find a new problem and never good news. So more bugs to kill off, time to get my SK boots on! *I will continue to take Milk Thistle, Chanca Piedra (which are both important for cleaning out the liver/kidneys), 600 mg DHA, Vit B-Complex, Vit C, Vit B12, and a few other supplements. I was using Artemisinin from Allergy Research Group for the past year but at my last visit my LLMD had me order this new one. I like this new one a lot better because not only does it have the Artemisinin in it but it also has other stuff to help get rid of parasites, immune support and calm inflammation at the same time.You will need a special code to order it and not everybody will be able to get a hold of some. I highly recommend it and so does my doctor. If you like and want to find the Artemisinin for cheaper prices then shop around. Many use VitaCost which I always find is always higher than what I buy all of my supplements for. 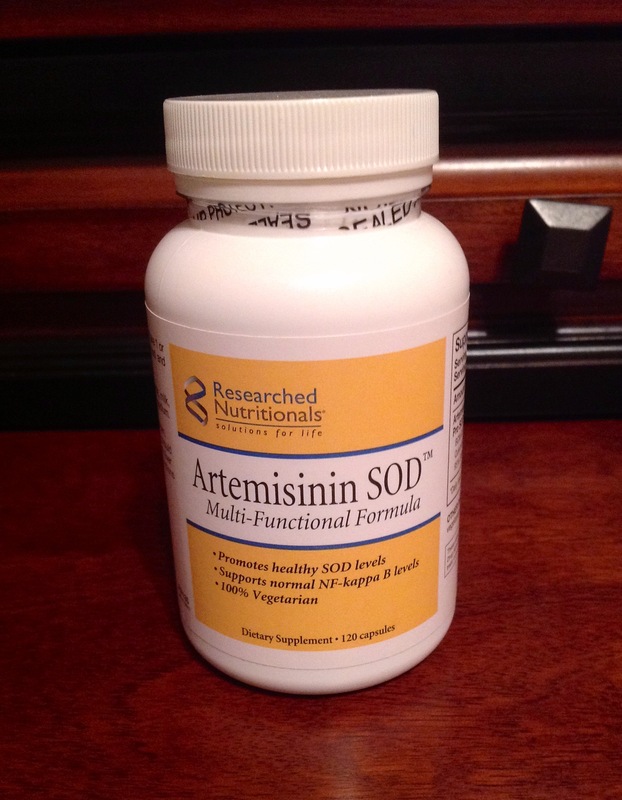 I found the Allergy Research Group Artemisinin online at 2 for $35.oo by using Google and then the “shopping” tab. I think I ordered it through pure formulas. That was on a sale and the price have gone back to normal. I prefer to buy my most of my supplements through Swanson and Amazon. **If you would like to buy this product you can ONLY do so from an LLMD office or by getting your LLMD/LLND’s name and signing up on the web site below. You need a “physicians code” or you cannot order it. Nuclear Factor kappa Beta (NFkB)is a naturally occurring protein that acts as a switch to turn inflammation on and off in the body. Scientists describe NFkB as a “smoke sensor” that detects dangerous threats like free radicals and infectious agents. In response to these threats, NFkB turns on the genes that produce inflammation. As we age, NFkB expression in the body increases, provoking widespread chronic inflammation. If you suffer from a nasty little parasite that is feeding off of your red blood cells called Babesia then you will most likely be prescribed Mepron. Mepron (Atovaquone) is a semi-thick bright yellow suspension (liquid) that is taken orally. The liquid resembles paint and us Lymies call it by a few nicknames such as “yellow paint”. Mepron can temporally stain clothing, kitchen sinks, counter tops or just about anything it touches. Be sure to brush your teeth after sipping it down. 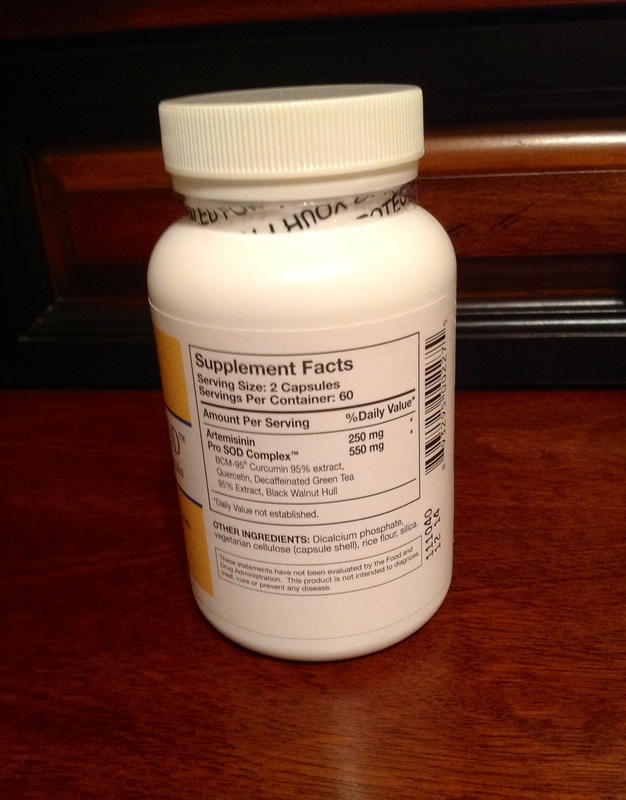 The average dose myself and others I have spoken to take daily is 1 tsp twice per day. You should usally be taking Zithomax (Azithromycin) with Mepron. Mepron should always be taken with at least 20-30 grams of good fats. *You can also eat chicken or sausage if you prefer but you will need to eat many pieces of chicken or many links of sausage. There are many other choices but these are some of the better ones. I was denied insurance coverage of Mepron last year while trying to get my prescription filled. I was told the Mepron would cost me about $1,500 out-of-pocket if I needed to buy it. After shopping around many pharmacies I found the cheapest price was $975 which is still way too much for any Lymie. Here is how I got 2 bottles of Mepron covered. My insurance company denied Mepron not only because of the cost but because there are alternatives such as Malarone. Malarone does not work as good as Mepron. I called my insurance company and they told me they were willing to cover it only if they knew that is the only brand/med that will work for my illness. So they asked that my doctor (LLMD) call them and verbally tell them that only recommends Mepron and that it is the only medicine that will help me. This took maybe two months of back and forth on the phone. My doctor would say he already called and my insurance would say they never received the call. So don’t give up. By the third try the insurance case worker and my doctor were on the same page and they agreed to cover only 2 months worth (2 bottles). I have since been denied any new prescriptions for Mepron. *This step may only work if you have little to no health insurance. Most likely they will approve you if you have no insurance. The makers of Mepron (GlaxoSmithKline) have a program to help patients get Mepron. You can find information about this program either from your LLMD, Online or call them on the phone. The program is called Bridges To Access. Click this link HERE and find out if you qualify for the program. I hear those who do qualify get at least 2-3 bottles for free. Good luck. Ask around to other Lymies. Many of us have a whole pharmacy at home and expiring meds. There are social networks such as Facebook or Twitter to ask around. 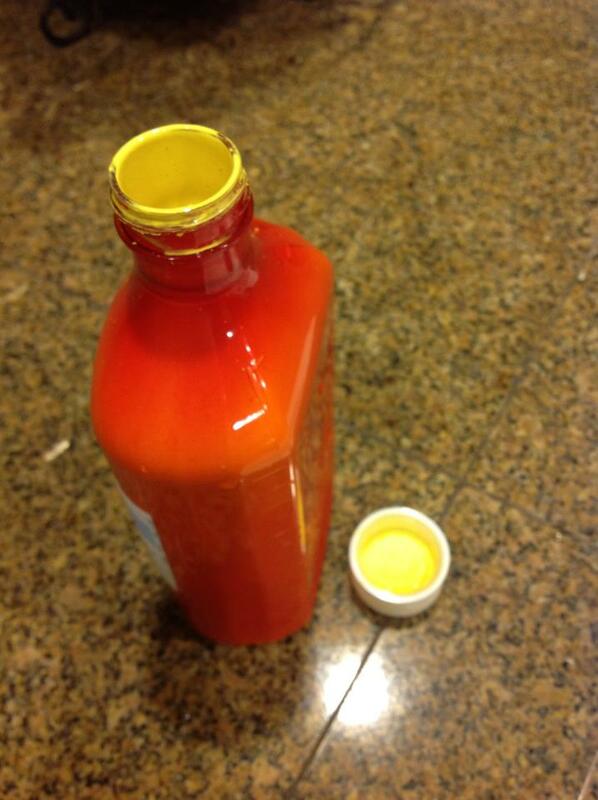 Usually people are willing to send you the bottle for free and they may even pay for shipping if you are in debt. If you know where to look there are groups for med exchanges. Yahoo Lyme groups are also good to ask around on. I hope these tips will help you get your Mepron. I had so much trouble getting mine covered and I know many of you do too. If you have any tips leave a comment and I will add them into this posting with your name. Thank you. PLEASE READ –> check my comments below for generous people who are willing to ship you their Mepron. I was able to get two more bottles for free in November, 2012 from a fellow Lymie via a group and I just paid shipping. Very nice person and helped save me $100’s-$1000’s! I don’t own a water bed but most of the time it feels like I do. I have been battling severe night sweats for about 23 years now. I was always an excessive sweater even on a cool day. My doctors told me my body just “cools down by sweating” even though I would sweat in the rain or snow. I now know a little annoying parasite called Babesia is the reason behind all of the sweating and air hunger. I remember as a teenager thinking “how will I ever get a girlfriend or get married if I soak the bed with sweat every night”. Later in life this did turn out to be somewhat of an issue with my girlfriend. No cuddling at night for me. I’m single now so it is no longer an issue I guess. I cannot count how many times I have woke up after 1 hour of sleep or 6 hours at the most to find myself in a puddle of sweat. My sheets and mattress are soaked to the core. I have even sweated through the sheets on a night that was 30-50 degrees in my old crappy house. I can feel constant beads of sweat on my forehead and dripping down my body. If I take the sheets off and lay under the ceiling fan I get the chills. So I can never win. I get the chills often but sweats the most. I dread summer and I stay out of the sun and hot places. When I used to work as a manager I had to wear button up shirts with a tie. I would always have sweat marks all over my shirts no matter what time of the year it was and even when I wasn’t doing anything physical. It was embarrassing and looked unprofessional. 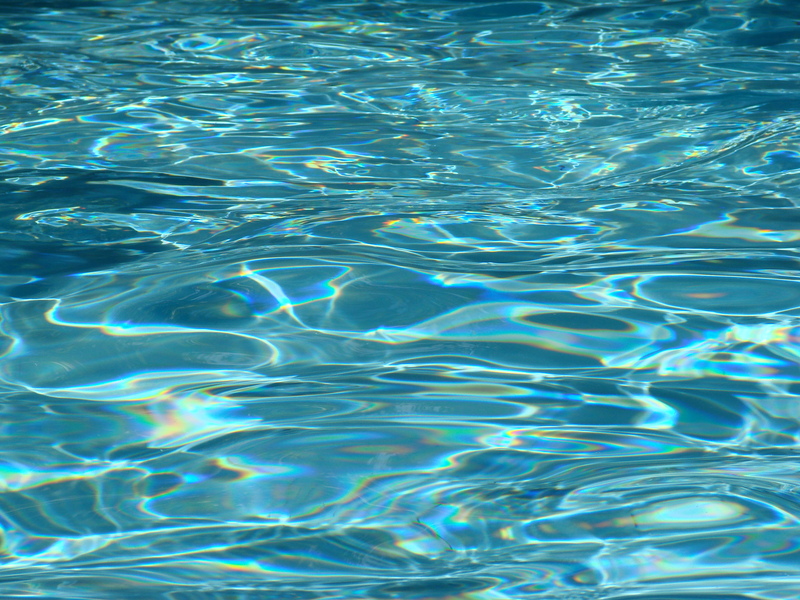 I will say that my sweat has no odor to it and it is almost like plain old water. I have been on Babesia meds for a year and a half. This stupid parasite just wont die. One day I hope to wake up like a normal person in my nice dry cozy bed. Let’s hope this happens soon.